The overstretching and tearing of the ligaments around the ankle joint may often result in an ankle sprain. When the ankle suddenly moves out of its normal range of motion, the ligaments endure additional stress which may lead to a tear. This can be a common occurrence in sporting activities, but can also happen in everyday movements such as stepping off a curb. High-heel wearers also need to be careful, as tripping may be common due to unstable shoes. Immediate pain accompanied by tenderness is often felt because of the damage done to the ligaments. Swelling and bruising around the ankle is typical and may cause the ankle to feel unstable, resulting in difficulty walking. An MRI or X-ray is sometimes necessary in determining the severity of the sprain and in ruling out a possible fracture. Typically, elevating the foot and wearing ankle supports or braces may aid in reducing swelling, making the foot feel more comfortable. Please consult with a podiatrist immediately if you think you might have an ankle sprain. When is comes to podiatric care, podiatrists strive to exhaust all nonsurgical treatment options first. However, there are times and many reasons why people may need foot surgery. Some of these include bunions, which are bony bumps that form on the base of big toe. Surgery may involve straightening the big toe if symptoms continue for a long period of time. Permanently bent toes, also called hammertoes, can be eased by removing the deformed joint between the toes, which improves flexibility. Rheumatoid arthritis can leave the joints in the foot damaged by inflammation. The exact procedure will depend on the severity of this condition, but surgery is commonly performed on the big toe in order to make walking easier. If the ankle is damaged, ankle fusion may be necessary to fuse the talus bone to the tibia, thereby relieving pain in the ankle. 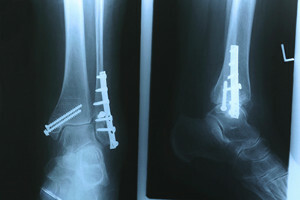 Screws are used to hold the bones together, and will heal for 12-14 weeks. Normal shoes can be worn soon afterward and it will be easier to walk. Please consult with a podiatrist to discuss all options when it comes to foot-related conditions. 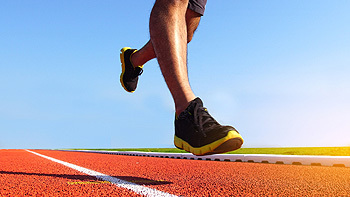 For more information about walking shoes versus running shoes, consult with Dr. Dean D. Hinners from Illinois. Our doctor can measure your feet to determine what your needs are and help you find an appropriate pair of footwear. Aging experts say that telling the elderly to take it easy and not exercise is bad for their long-term health. Many believe that aging causes a loss of strength and fitness, but some experts say it is actually the opposite. 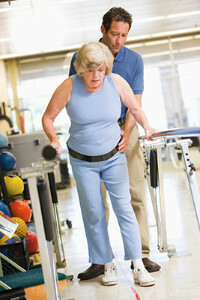 The elderly have an increased risk of falling due to slower reaction times and decreased fitness. Encouraging the elderly to find activities that promote exercise and to follow a good diet can help decrease the risk of falls. If you are older and wish to start exercising, check with a doctor to see if it is right for you. Wearing shoes without socks has caught on in recent years as a new fashion trend partly due to the rise in popularity of slip-on shoes. However, this new trend in shoe fashion may have a negative impact on your foot health. The foot routinely sweats throughout the day, and socks play a role in wicking away that moisture to help keep the foot dry. A number of shoes are not made out of breathable material which, coupled with a lack of socks, keeps moisture on the foot and can make you more susceptible to foot ailments like athlete’s foot or toenail fungus. Generally speaking, wearing socks with your shoes is a good idea. If, however, you still prefer to go sockless, be sure to let your shoes air out for 48 hours after wearing them, use antiperspirant, and wash your feet after wearing them. A new study conducted by the University of Oregon, and with the participation of Stanford University, the University of Southern California, and the University of Colorado Boulder, seeks to identify athletes who are likely to develop stress fractures. With newly known risk factor indicators available, athletes who are at risk for stress fractures can be alerted and allowed to rest to prevent them. Stress fractures, or tiny hairline fractures in the bone, most commonly occur from overuse and lack of rest. The study is still in its early stages and will take several years to produce conclusive results. Researchers are hopeful that this will help prevent athlete's injuring themselves and allow them to keep playing. Activities where too much pressure is put on the feet can cause stress fractures. To learn more, contact Dr. Dean D. Hinners from Illinois. Our doctor can provide the care you need to keep your pain free and on your feet. Tarsal tunnel syndrome is a condition in which the posterior tibial nerve in the tarsal tunnel becomes pinched or compressed. This causes a number of symptoms including burning and shooting pain, a pins and needles sensation, numbness, and tightness in the foot. There are several reasons why the nerve could become compressed, which include bony prominences, bone spurs, abnormal heel position, and the swelling of tendons in the tarsal tunnel. Due to the nature of tarsal tunnel syndrome, diagnosis may be difficult because it can seem to mimic the symptoms of other conditions; heel pain and arch pain are some examples. It is best to see a podiatrist if you are experiencing any of those symptoms. Podiatrists can offer a number of treatments, such as orthotics, taping or bracing, rest, icing, anti-inflammatory medication, or even surgery if other treatments do not improve your condition.